I bought the Frigidaire Gallery washer 7 years ago when I first got married and I love it! It's been a great washer for my now family of 4, including two grubby kids and a husband. I use it approximately 8 loads a week. The top loader is easy to use and does a great job of getting my clothes spotlessly clean. It never has dry soap that hasn't dissolved in the bottom, a complaint I've had with other top loaders. It has 10 different cycles and two speeds of washing. You can for sure find the cycle that will keep your clothes looking great for many years. The motor on it is plenty powerful to get my heaviest jeans and biggest towels clean. The loader is large and I can fit at least 8 pairs of jeans and 8-10 6-8 towels in a given load. I can even fit small comforters in it which saves money when I don’t have to go to the Laundromat to clean those big blankets. The dial for small to large loads is a great money saver. The dispensers for bleach and fabric softeners are easy to use and work well. I have used front loaders in the past and don't like how you have to use specialty liquid detergents for them. My Gallery top loader holds just as many clothes and I can buy the cheaper bargain brand detergent which works equally as well in this great top loader. I have never had to have it repaired, and hope it lasts me another 20 years! If it happens to break down, I will definitely purchase another Frigidaire. We have the matching dryer as well and have been equally as pleased with its performance. It was a great value too as it was definitely in the mid-price range and much more affordable than most front loaders. I know some people prefer front loaders, but I don’t think I would ever buy a front loader after how pleased I’ve been with this Frigidaire top loader. I've been completely pleased my the purchase and would buy Frigidaire again, even for other home appliances. The fast cycle, leaves clothes practically dry. The quick wash cycle takes only twenty minutes. Uses High Efficiency detergent and is environmentally friendly. Uses very little water. Bad: Very loud spin cycle, hot/cold connectors reversed. End of cycle chime a screaming sound not a pleasant bell. Join in and write your own page! It's easy to do. How? 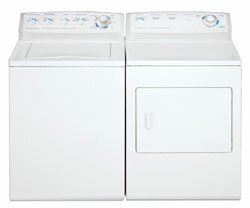 Simply click here to return to Frigidaire TOP LOAD Washing Machines.